So I’m at the Greenport farm stand with Vinny, buying fresh local stuff for our Caribbean cooking extravaganza (see chipotle jerk slow cooker chicken if you haven’t already) and just for dinner in general. Vinny selects some beets for grilling which is new for me and therefore very exciting. But I am not distracted enough by this to miss the shocking fact that Vinny has told the nice woman at the farm stand to go ahead and cut off and discard the beet greens, which she does. 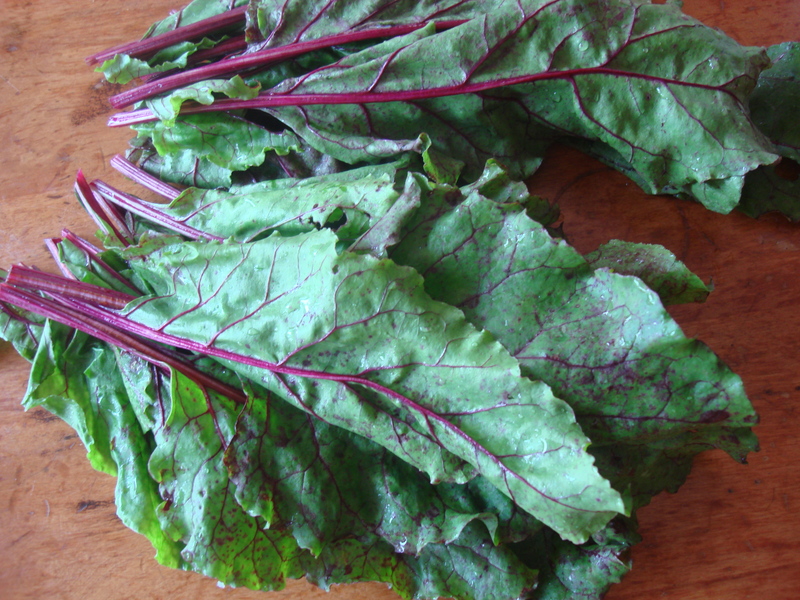 Beets are available year-round, but are best from June to October and that’s when the beet greens are best too! “What do you do with them?” asks Vinny. And he is drowned in words, as I and the nice woman at the farmstand tell him — at the same time — how delicious they are and how good for you and how easy to prepare. Vinny is always game for a new adventure, so we take the greens back with my promise that I will show him how to do them. This veg adds color and texture to your plate. They have their own natural saltiness. Beet greens, which should be removed about an inch above the root as soon as you have a chance, are full of folate, phosphorus, zinc, and a bunch of other good nutrients They are low glycemic and filling, and for more on the nutrients, click here. 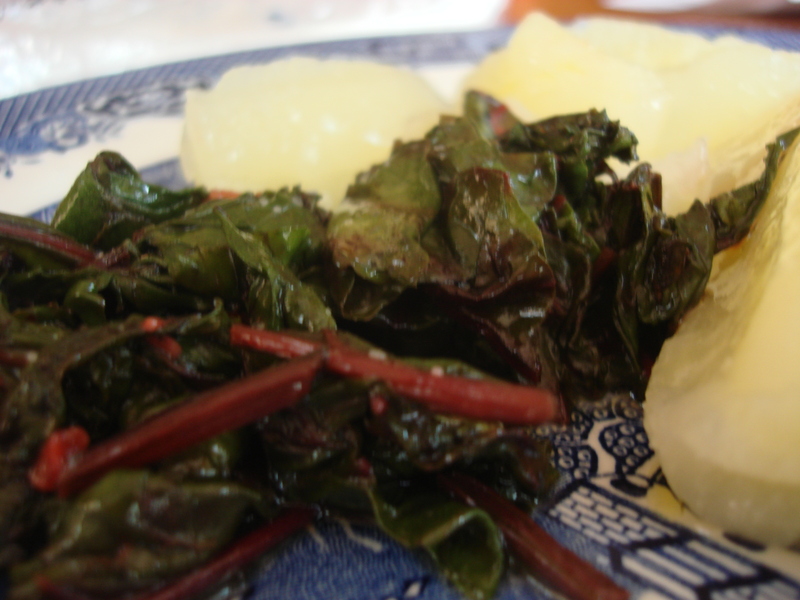 While beetroot will keep in the fridge, beet greens should be used quickly. They are super tasty and make for a fast vegetable side. Plus, you pay for them! Why aren’t you using them? I like to mash mine into bolied yuca or boiled potato with olive oil…and that’s just what I did after taking this photo. Chop the greens roughly (or not, if you like a longer leaf), removing the tougher stalks. You can roll them up and slice strips too. Thoroughly rinse and spin the beet greens. Heat the olive oil and garlic in a skillet on medium, letting the garlic get golden without toasting. Add beet greens, stir to coat and cook on medium until completely wilted and tender (you may need to add a Tbs of water if things get too dry). Salt to taste and serve. We love beet greens. I’m surprised that more people don’t eat them, they are delicious. I love beet greens . . . now. When my mom used to try and feed them to us as kids, not so much. 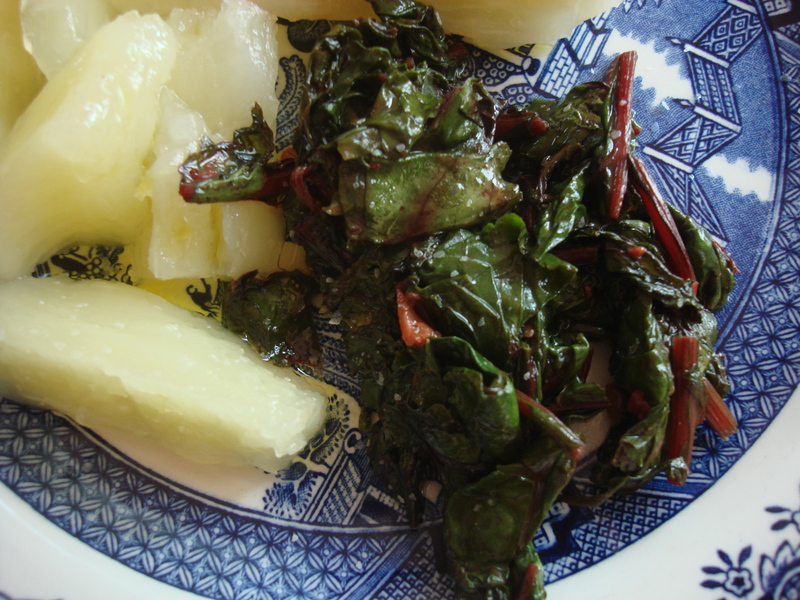 But I just steam mine (like chard or spinach) and dress with a splash of vinegar or lemon juice. Delicious and soooo good for you! Love the idea of using the whole product. I hate waste!! Absolutely! And they are so delicious! I have to admit that, in beet season, I have so many beet greens that I’m not able to eat them all (especially the week I can pickled beets). However, I do love eating some of them stir-fried, especially with an egg cooked over the top. It makes a great one-dish lunch. And then, whatever greens my family and I can’t eat, the chickens are more than happy to polish off! Oooh, you are good..canning beets…I am just an amateur when it comes to preserving!